A cross view of the front garden. Sidewalk leads to the front door (to the right). I've made very few changes to the front so far. Some fall-like colors in the back sunny garden. 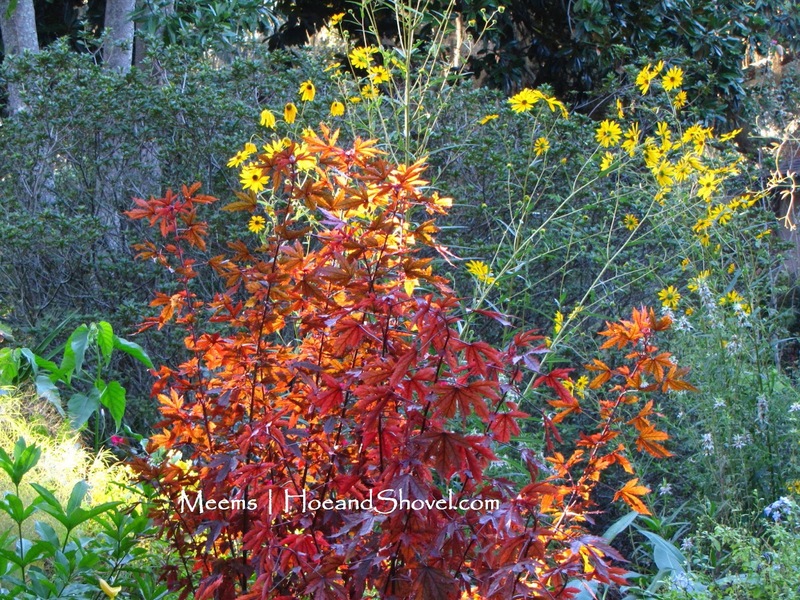 Maple leaf hibiscus and Swamp sunflower. When we made that decision it changed my perspective instantly. My adrenalin sent my planning, organizing self into overdrive. I was consumed with how/where/when to move plants and to start cuttings from my old garden. I challenged myself to get this garden started without spending any money on new plants. That's was super-fun. I worked straight through the heat and humidity of summer in order to accomplish that first phase of making my new garden a place of respite. With all that said, I'm trying my best to take my time and really think out what and how much I want to add to this garden overall. Some would say it's too late for that because I've already added so many plants and created so many new spaces. I guess what I mean is that I want to try to stay true to the overall feel of this piece of property. This property has a natural, woodsy feel to it. Mature saw palmettos gather in clumps beneath tall old oaks throughout the front and back. We are only a lot away from a cypress hammock that surrounds a conservation water area. The view across from the fire pit and on the way out to the far back yard. This was a huge bed of invasive Mexican petunia when we moved in. I am still pulling out pieces of it as it shoots up. So far my thoughts are to keep this garden looking more natural. Less manicured. Maybe even less plants. Did I just say that? By less plants I mean planting less crowded in some of the beds. 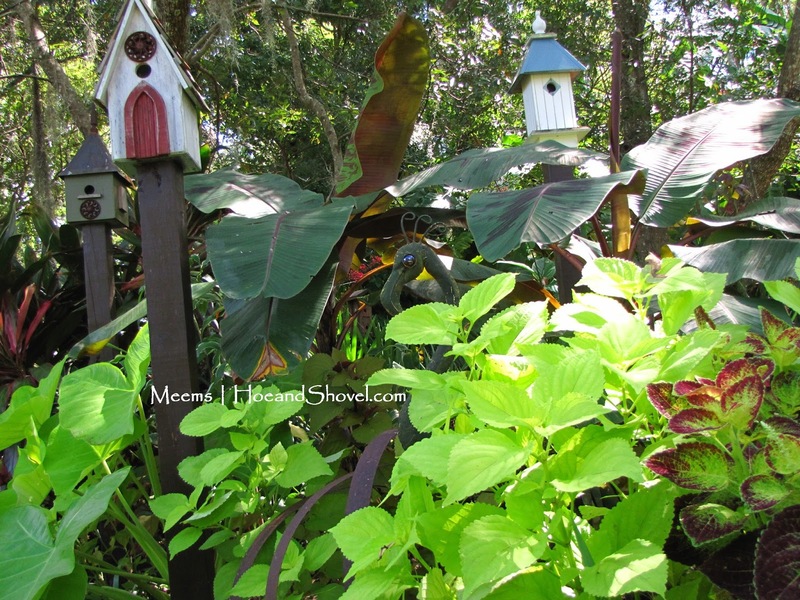 Tiny slips of rooted coleus from my old garden were planted in the Birdhouse Garden in June 2014. Our rainy Florida summer was just what they needed to flourish. The views in the shadiest part sorta contradict what I just stated. That's okay. I'm not committed to less crowding everywhere. This is the back side of the sunniest part of the garden. 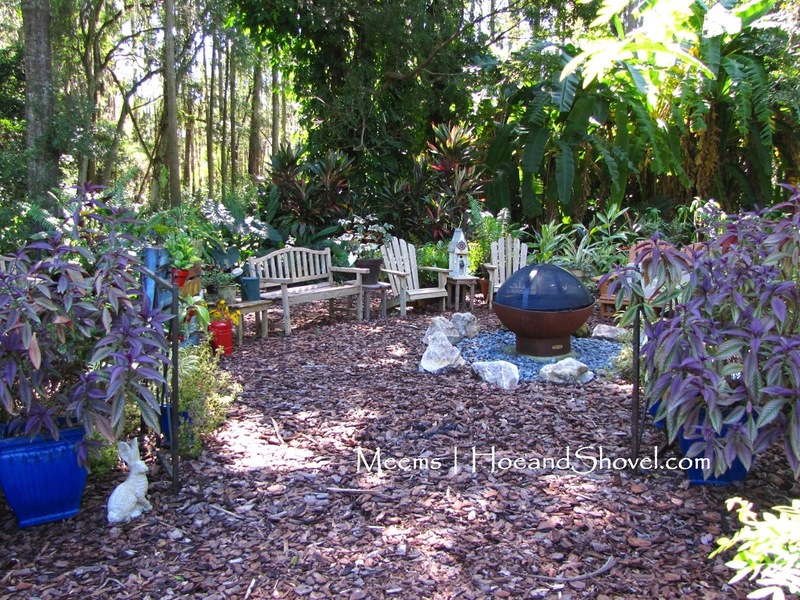 The plumbago in the center is the only plant that I left in this bed when I started adding my own plants. Grass was removed from the front 8' in early July to enlarge and enhance the shape of this large bed. I have to admit the whole challenge of moving to a new garden, although heartbreaking at the outset, has been an extremely rewarding and fun endeavor. As I look back on the decisions we made with a clearer perspective I think I actually needed a change-up. It has given me new inspiration and sparked fresh ways of thinking and designing. Especially in my sunniest garden that is in the wide open back part of the yard. 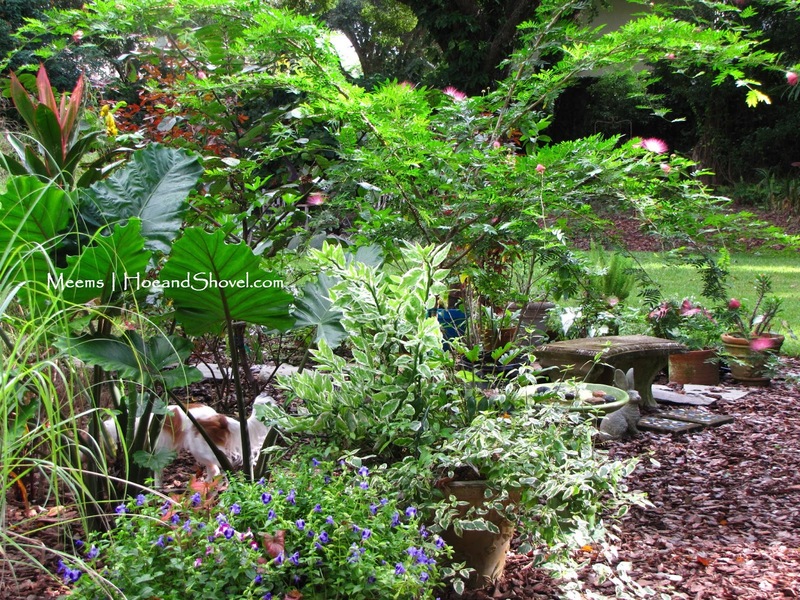 The partially shady area that I created first thing in order to move my birdhouses and the plants you see here. You can see how I did it and the before and after photos here. My old garden was filled with literally thousands of plants jammed in so tightly there was hardly room for anymore. I loved the layout of that garden. I'm learning to love the layout of this one. 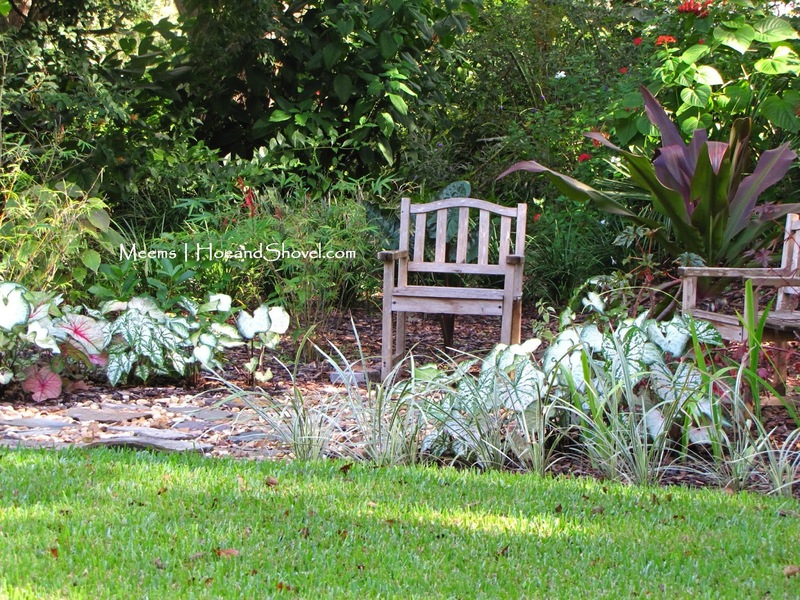 Seating arrangements are a key element in any garden to instantly add a sense of warmth and coziness. I moved most of my Adirondacks, benches and captain's chairs from my new garden. 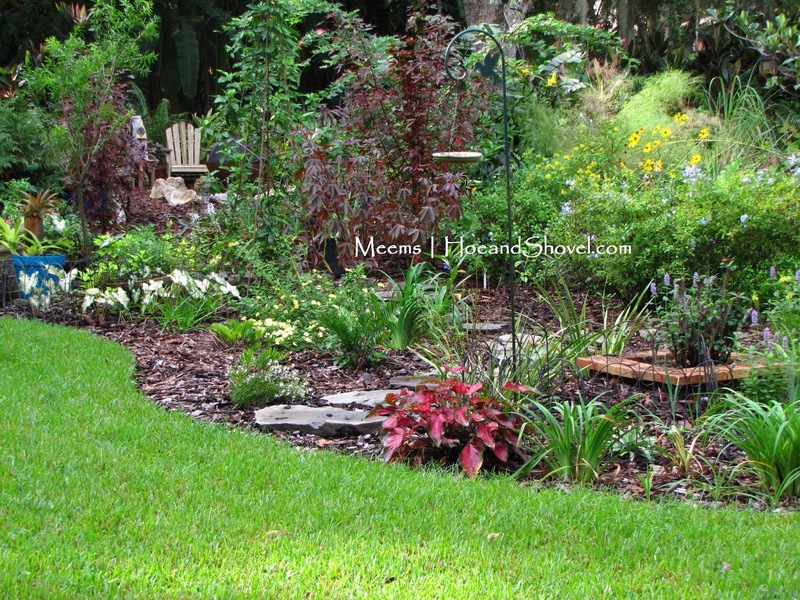 Finding suitable places for all of them has involved creating inviting planting beds. Part of the front garden. 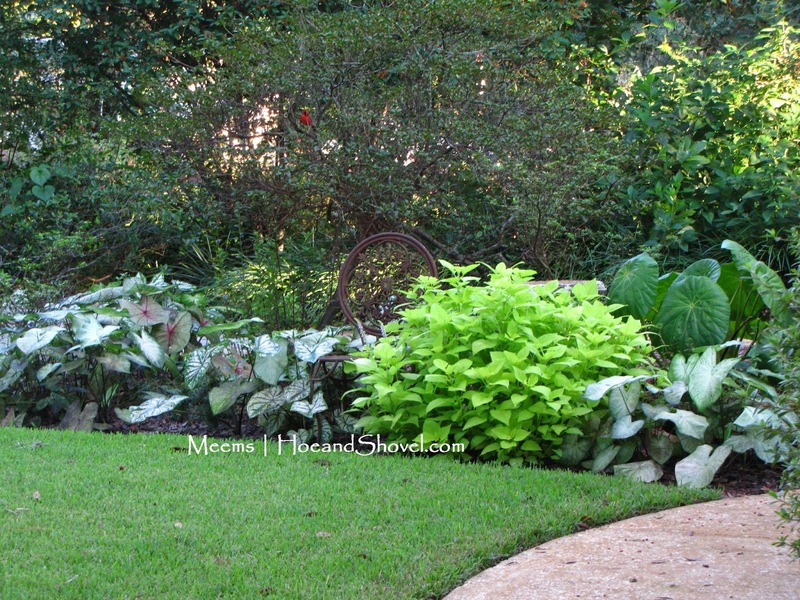 I moved the lime green coleus, the iron chair, the begonia, and the birdbath from my old garden. Lots of mixed white Caladiums were planted from bulbs in July. I'm feeling blessed and satisfied that we made the right decision to stay here. Now that I've embraced this new garden my mind whirls with ideas and plans for improvement. I'm gonna take my time. As much as I LOVE maintenance (I really do) I'm trying keep maintenance low. We have other interests and we like to pick up and leave when we want to for short periods of time. So far we've been able to do that without worries. What about you? What's new in your garden? I hope your fall garden is off to a great start. I enjoy watching your new garden evolve Meems. Even though our gardens are complete opposites I find inspiration here. Keep up the good work. Everyone I know is coming to that age that where less is more. Thank you, Lisa, I'm thrilled you still visit me ... I always appreciate your encouragement. 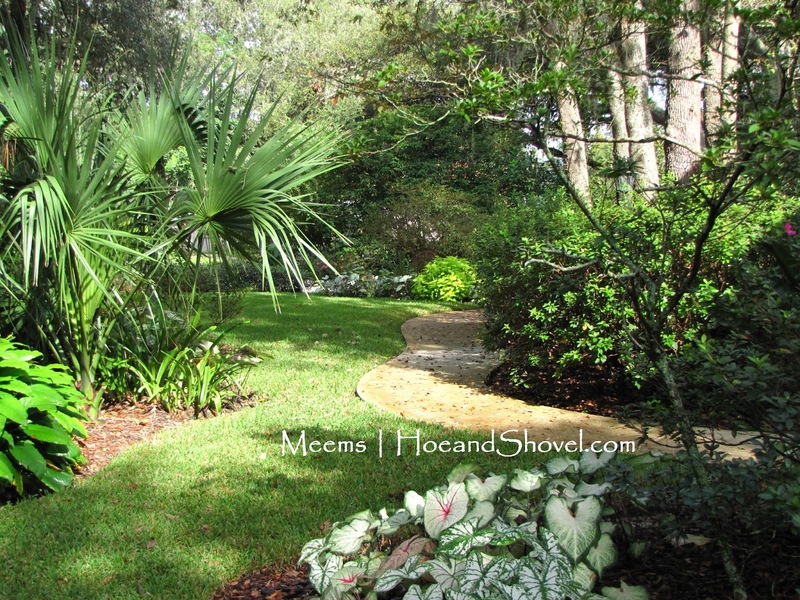 Dear Meems ~ I love your new garden. A visitor would not know that it is new. This post has inspired me as I keep working on my own property. Life has changed for me, as you know, and my gardens are my therapy. Thank you for your kind comment on my latest post. I wanted to make that heart patio ever since losing my dear husband, Dec. 2012. We had the marble pieces, I had the will and while it is still a work in progress, it brings me joy. I miss my husband every single day, but feel his love surrounding me in all that he did around here, it is evidenced everywhere. This garden had some great foundation to work with Lorraine. I know your husband is so proud of the way you are living life even though he isn't with you anymore. 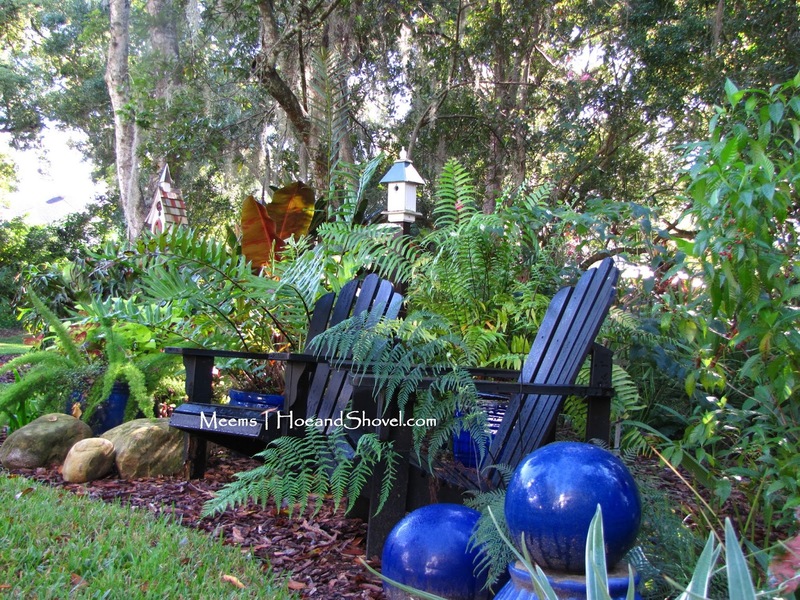 You have done some very clever projects to keep your little Plum Cottage a peaceful haven. It's looking great. Isn't it wonderful how God gives us just what we need? So glad you are enjoying the challenge of your new space. I'm so happy for you. It's truly amazing Daisy how God knows us better than we know ourselves. He is so faithful. Wow! It looks awesome, like it has been there forever. I have always loved your little seating areas and so glad that you replicated that. I also use my neighbours garden as a backdrop to mine. Thank you, Rose. It's not an easy ambition to stick with a less is more philosophy, but I keep reminding myself that I want less to maintain while still having plenty to tend and care for. Well, good luck as you settle in there at your new place. I know what you mean about using "less", but it's challenging for us garden lovers, isn't it? There are always new plants out there calling our names! Yes, it is challenging Robin. I'm not at all sure I will stick with my newfound philosophy but I'm going to give it a good try. :-) I find myself leaning in the other direction often. There's room to plant and I have lots of design ideas in my head. Wish me luck.